Caution should be exercised if you get this error and our bug tester did, so here is the advice. The database already exists in the folder or cannot be created but is not shown in the server, so in EasyDose context, move it and the associated log file (notice we didn’t say delete it), create the catalogue and restore from a backup. 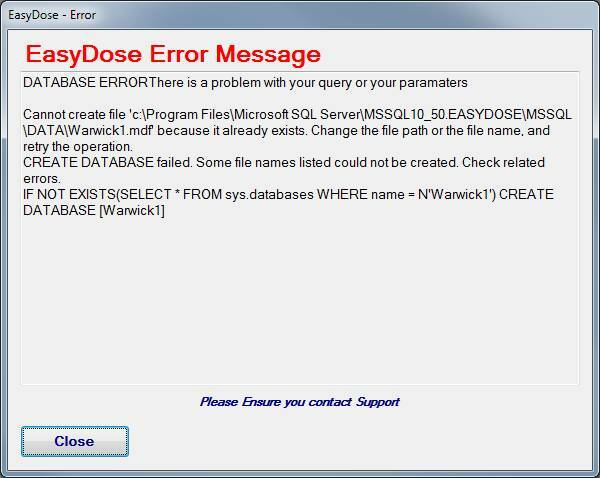 The more technical answer is to have EasyDose staff re-attach the database (if it is not corrupt – which is a reasonable possibility). Also, ensure you are not using a Windows System Reserved word in the catalogue name.